There are two almost identical versions of this pack from 2009. The one I have has "Salvage" instead of "Wages of Sin" (2006) which is in place of "Bloody Mary" on the cover of the other. "Wages on Sin", however, is also on the second (chronologically the fourth or fifth) of my "4 Films" collections. Thus, Echo Bridge Home Entertainment were up to confusing mischief right at the beginning. Prior to June 2009, the 20 "Horror Classics" multipacks were made up of Public Domain movies much like the ones from Mill Creek Entertainment so everybody thought the duplicates were merely schoolboy errors from a new company rather than intentional. How wrong we were! While the "official" Volume 1 contains "Prom Night" (1980), "Nadja" (1994), "Skeleton Man" (2004) and "The Nurse" (1997), Volume 2 has "The Satanic Rites of Dracula" (1973), "The Terror" (1963), "Night of the Living Dead" (1968) and "The Devil Bat" (1940). The throwback/reissue of four titles from their Public Domain catalogue makes a bit of a mess in the midst of the more modern horror movie packs especially as everyone is likely to have them several times over from other sources. Thinking that the series was only going to be a repackage/reissue of "Horror Classics", many collectors decided to ignore these multipacks in favour of the ones from Mill Creek Entertainment from then on. Being a late arrival to the party and already a collector of Mill Creek packs, I missed out on this kerfuffle completely. If you think that I should have started with the chronological first volume rather than the first one I bought, you can rest assured that we haven't heard the last of "Prom Night", "Nadja", "Skeleton Man" and "The Nurse" by any stretch of the imagination. "A family movies to a small town to run a long-abandoned funeral home, only to discover that something evil lurks there—something that raises the dead and feeds upon death itelf. Starring Dan Byrd and Denise Crosby. Directed by Tobe Hooper." Most people (especially on message boards) seem to really hate this Lovecraft-style "B movie", but it's not that bad until the CGI vines and zombies start appearing. "Mortuary" has a good atmosphere for the first 30 minutes or so and a fair bit of creepiness going on. Too much comedy ultimately ruins everything, the pace drags in the middle, and it's a bit of mess towards the end, although it's still about the same as something moderately gory which you'd normally see on the SyFy channel. Dan Byrd is a couple of years too old to play a teenager and Denise Crosby from "Star Trek" looks very worn, but neither is as bad as 34-year-old Alexandra Adi playing half her age (even though she doesn't look it unless you scrutinize her). If there's any justice in the world, I'm sure she looks her age nowadays. The worst offender, however, is diminutive 12-year-old Stephanie Patton playing either an 8-year-old or a mentally challenged tweenager. In fairness, it's hard to decide what she is other than extremely annoying. "When Dr. Taylor Briggs is exposed to a mysterious drug while lecturing in Brazil, he is forced to relive the dark, twisted memories of a killer whose work may not be over. Starring Billy Zane, Tricia Helfer, Ann-Marget and Dennis Hopper." For a slow-moving, Billy Zane-centric thriller, this isn't bad either. The made-for-TV aesthetic is a little bit off-putting at first, but when the horror elements start kicking-in, it's all very entertaining. The twist/reveal is a tad "Scooby Doo" and doesn't come as a big surprise if you watch a lot of movies like this. Don't expect any gory unpleasantness from "Memory" as it's primarily one of those predictable "hero shares a psychic link with a kidnapper/murderer" deals with the usual discovery contrivances, some product placement, and a couple of nice tweaks to the formulas. Even from a heterosexual male point of view, Billy Zane is a very attractive man, and this is an excellent vehicle for him to show his talents as an actor. The only bad point is a confusing scene 1 hour and 15 minutes in which feels forced rather than being part of any logical progression or set off by any trigger. Since the dénouement follows it, it's a glaringly rushed join. "When a group of psychiatric hospital nurses invoke the spirit of Bloody Mary—a supposed urban myth—the slaughter begins. The legend is real, her vengeance is fatal, and to free her, all you have to do is say her name." After two reasonably good movies, by necessity there has to be a bad one. Lots of pretty girls can't redress the balance in this "Candyman" clone, but they do at least try to by showing some skin. The opening scene has the best looking actress, and it's amusing watching her walk toe-to-heel without any shoes on. A nurse who is used to wearing high heels gives away the casting decisions. If you're not a fan of "Candyman" or the "Urban Legend" trilogy, "Bloody Mary" is a lower-budget alternative which fits into the latter's "trendy teen horror" subgenre with no problem. As a supernatural slasher, it's not very memorable though. "Claire Parker is going to die. At the hands of a sadistic and depraved killer, she will endure a terrifying, unimaginably brutal death—and it will all happen again. Starring Lauren Currie Lewis and Chris Ferry." Having once owned the single DVD version of "Salvage" which I sold at a yard sale years ago because it was so amateur and boring, I don't really need to say much more about it. It's yet another confusing, low-budget horror version of "Groundhog Day" which also owes an enormous debt to all the old Amicus anthologies or anything else with a downbeat twist at the end. It's "windowboxed" too to save space. Don't do what I did and confuse "Salvage" (also known as "Gruesome") with the 2009 movie of the same name which was filmed on the set of "Brookside" because it isn't the same thing at all. Despite being bare-bones releases, these movies don't need any extras anyway so having two on each side of a single DVD without commentaries and featurettes isn't anything to complain about. The menu system is adequate and the transfers are decent enough. The only problem for collectors is that these movies have been repeated another 6 times throughout the "4 Films" and "Midnight Horror" DVD packs without even counting the latest Blu-ray versions. 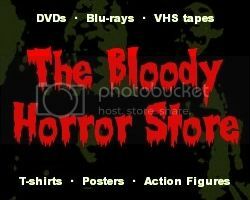 Nowadays, "The Midnight Horror Collection: 8 Movies Pack Vol. 5" has replaced this set (plus the following one), offers marginally better value for $5, and takes up one less shelf space. Obviously, the "4 Films Horror Collector's Set" is still worth buying for $2.99 from Kmart (or less on Amazon and eBay) if you either don't want or already have the other titles.